Portable fire extinguishers provide the first line of defense. Regular inspections and required maintenance reduce the risk of damage. Each year fires cost business more than $10 billion in property damage and injure more than 17,000 workers. Stay current with required fire protection inspections to reduce your risk of loss. Combine with two other services to save 15%. Alliance Fire Protection ensures that your facility is properly equipped to face a fire emergency and compliant with all applicable regulatory code. Contact us today for a no obligation assessment of your facility. We'll determine the types of fire risks you face and recommend the fire protection equipment and fire extinguisher services that are most effective for your business needs. Fire sprinklers are complex systems that require routine maintenance to ensure proper function when activated. If there is ever a leak, our 24 hr on-call staff is available to assist you and prevent further damage to your property. Alliance Fire Protection ensures that your facility is properly equipped to face a fire emergency and is compliant with all applicable regulatory code. We install, test, maintain and repair your fire sprinkler system. Even if we did not install your fire sprinkler system, we will maintain and repair it. A fully functioning sprinkler system will start dowsing a fire before the fire department arrives. Fires spread at an alarming rate. Well-maintained fire sprinkler systems help to slow the fire's progress until emergency personnel arrive on scene. Over 1,000 times a day, fires ignite in commercial kitchens. The failure of a suppression system to operate properly will prove very costly. With today's high temperature appliances using oils and solid fuels, it is essential that your fire suppression system be maintained in good operating condition. Alliance Fire Protection designs, installs, maintains, tests and repairs fire suppression systems. Our services reflect an understanding of your facility's special requirements. AFP's certified and trained technicians are your best defense against fire loss. Regular inspections provide peace of mind that your systems are in top working order. Combine with 2 or more other services for a 15% discount. Regular maintenance of the kitchen hood + exhaust system, along with a deep cleaning of the grill, ensures a safe cooking environment. 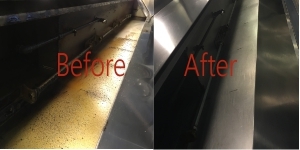 Properly maintained kitchen equipment leads to a cleaner, cooler and safer environment for employees. Alliance Fire Protection understands the importance of a properly maintained kitchen and can combine this service with your Kitchen Suppression System inspections, your Sprinker inspections and/or your Fire Extinguisher services for greater discounts and convenience to you. ​Let us make sure you are always in compliance with industry codes and regulations. We look forward to servicing you. Half of the 11,200 structure fires each year reported by eating establishments originate in the cooking area. Let Alliance Fire Protection keep you grease-free and safe from the damage of a kitchen fire. Maintain compliance with your County Backflow test requirements. Southern California Counties are committed to providing safe drinking water. To ensure this, backflow testing is required. Backflow is a reverse flow of contaminated water or liquid caused by cross connection, which allows contaminates to flow towards the public's drinking water system. ​Alliance Fire Protection ensures that your facility is properly equipped with a backflow preventer to eliminate the cross connections and provide a barricade to backflow. Without a backflow test and backflow prevention assembly, you could unknowingly be pushing contaminated water back into the clean water supply. Even if you have an existing backflow device, annual backflow testing is commonly required to guarantee that the device is working properly. Let us take care of that requirement for you. Contact us today for a no obligation assessment of your facility. We'll determine the types of risks you face and recommend the backflow protection, fire protection equipment and fire extinguisher services that are most effective for your business needs. OSHA mandates fire extinguisher training. Call Us to Keep Your Business & Employees Safe! All Fire Equipment Inspections, Tests & Cleanings Performed in accordance with the NFPA and California Title 19 Regulations.